Medium power (1200 W), Leader SMOKE 3 has a good ability to create smoke. Produces light or dense smoke with adjustable flow rate. Select time interval between smoke emissions. Continuous dense smoke production in order to avoid interruptions of operation during the programmed period. Continuous operation at reduced flow rate by default for maximum fluid economy. 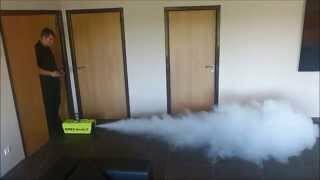 Leader SMOKE 3 generates dense, realistic smoke and is the perfect tool for evacuation drills and completely safe training. A removable and digital remote control allows to measure the volume of smoke required for each scenario and to adjust smoke emissions time length and interval. The robust and compact design makes it the ideal tool for creating different exercise scenarios. Discover the LEADER SMOKE 2, the old generation of LEADER SMOKE 3 and how to use it.